BIG was commissioned to design the tower after 21st Century Fox and News Corp signed on as tenants. The media companies, founded by Rupert Murdoch, were to occupy the lower half of the tower, while the upper portion would be leased to other commercial tenants. Company leaders requested that BIG redesign the skyscraper – reportedly because they felt the design by Foster was "more suited for an investment bank than a modern media company". BIG unveiled a scheme last summer that consists of seven stacked cuboids that rise to a height of 1,340 feet (408 metres). The design was a response to the tenants' desire: Ingels said the CEO of 21st Century Fox, James Murdoch, told him "he didn't want to build a tower". "The needs and requirements of the media company and other tenants are concentrated into seven separate building volumes, each tailored to their unique activities," Bjarke Ingels describes in a video about the project that was produced by 21st Century Fox and News Corp. 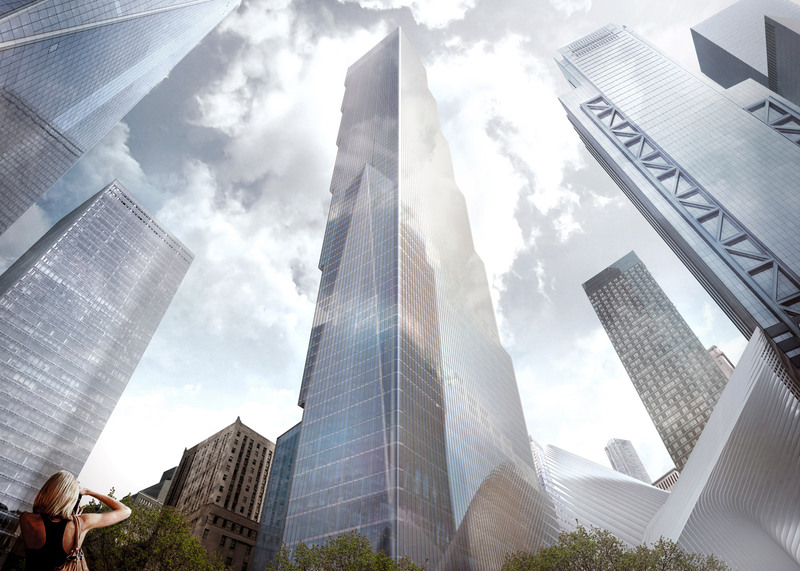 The 2.8 million-square-foot (260,000 square metres) building would appear tall and slender when seen from the World Trade Center Memorial Plaza, but from a distance, its stepped form would be more apparent. Its large setbacks would form verdant terraces and offer expansive city views. "From Tribeca, it will appear like a vertical village of singular buildings each tailored to their individual activities stacked on top of each other, forming parks and plazas in the sky," said Ingels, referencing a neighbourhood just north of the site. Norman Foster unveiled his design in 2005, proposing a 79-storey glass tower with a slanted top. "Arranged around a central cruciform core, the shaft is articulated as four interconnected blocks with flexible, column-free office floors that rise to level 64, whereupon the building is cut at angle to address the memorial below," the firm describes on its website. "The concept is driven by memory; but equally it is motivated by a sense of rebirth, its sparkling glazed crystalline form and diamond-shaped summit forming a bold new addition to the New York skyline." Two World Trade Center will join two completed towers – One World Trade Center by Skidmore, Owings & Merrill, and Four World Trade Center by Fumihiko Maki – along with the under-construction Three World Trade Center, designed by Rogers Stirk Harbour + Partners. All three are linear towers sheathed in glass. The site also contains the new a transportation Hub by Santiago Calatrava, a museum by Snøhetta and Davis Brody Bond, and a pair of memorial pools by Michael Arad and Peter Walker.